A deep-retrofit of an unloved mid-century factory building delivers major improvements to the streetscape and creates modern office spaces that has already attracted creative blue-chip tenants. 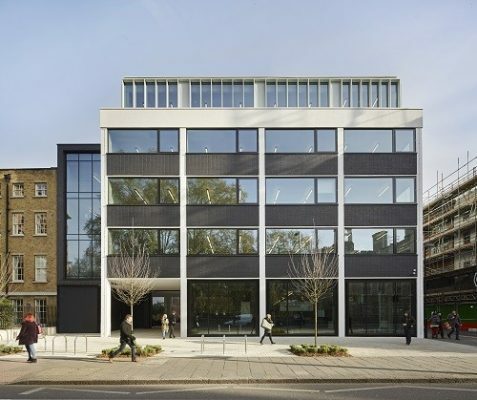 BuckleyGrayYeoman has completed C-Space, a 62,000 sq ft commercial workspace on the corner of City Road and Epworth Street in Shoreditch, East London. Working on behalf of developer Helical Bar, BuckleyGrayYeoman oversaw the retrofit of the 1960s former carpet factory, substantially re-modelling the building into a stylish commercial development with flexible spaces that celebrate its industrial heritage. 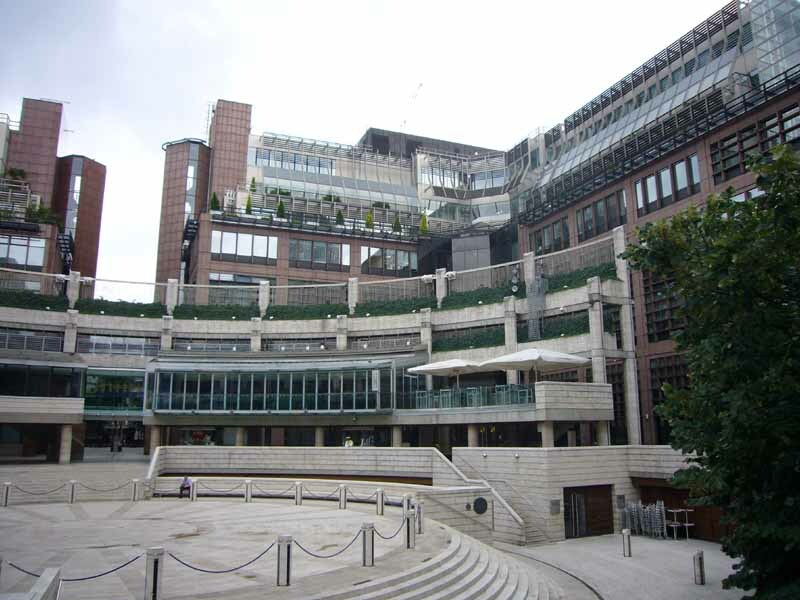 C-Space, named after the shape of the building in plan, is located nearby a collection of significant listed buildings including Armoury House and Bunhill Fields immediately opposite and John Wesley’s house and Chapel, a collection of Grade I listed 18th Century buildings, next door. BuckleyGrayYeoman’s design redefines the building’s relationship with the street and its surroundings, removing a portion of the City Road façade to create a setback that dramatically improves views of Wesley’s House from the South. Space once taken up by a neglected planter has been turned into active pavement with newly planted trees and public cycle parking facilities. 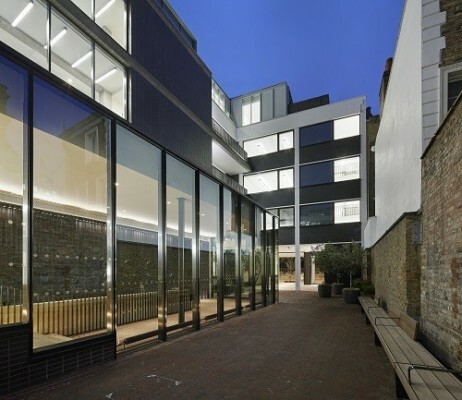 The comprehensive refurbishment has rejuvenated the existing facades and extended the building upwards creating an additional storey with 12,000 sq ft of additional office space. 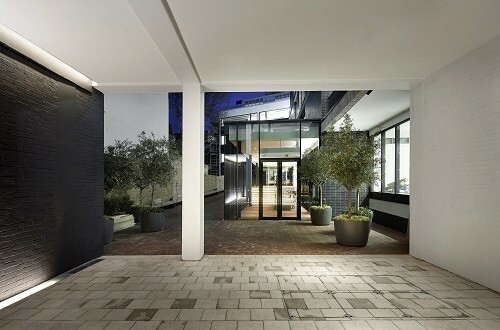 BuckleyGrayYeoman has brought the building’s courtyard back into use, paving it with herringbone brick to create a new pedestrian route between Tabernacle Street and City Road that is accessible throughout the daytime. 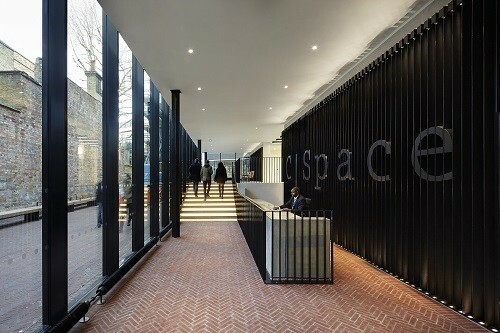 Within the new C-Space courtyard sits a full-height glazed reception. 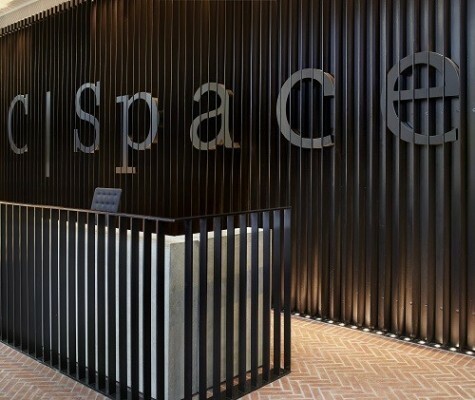 The C-space interior features an effortless stylish ‘raw’ atmosphere and a unique material palette, including a black steel feature wall with an exposed concrete desk and herringbone brick floor. BuckleyGrayYeoman’s design has cut away the floor next to the ground floor windows to allow natural light into the basement and create office space. A new circulation core has been added to the heart of the building creating a new entrance from City Road. “C-Space offers high-quality office accommodation in this fast-developing Shoreditch fringe area. 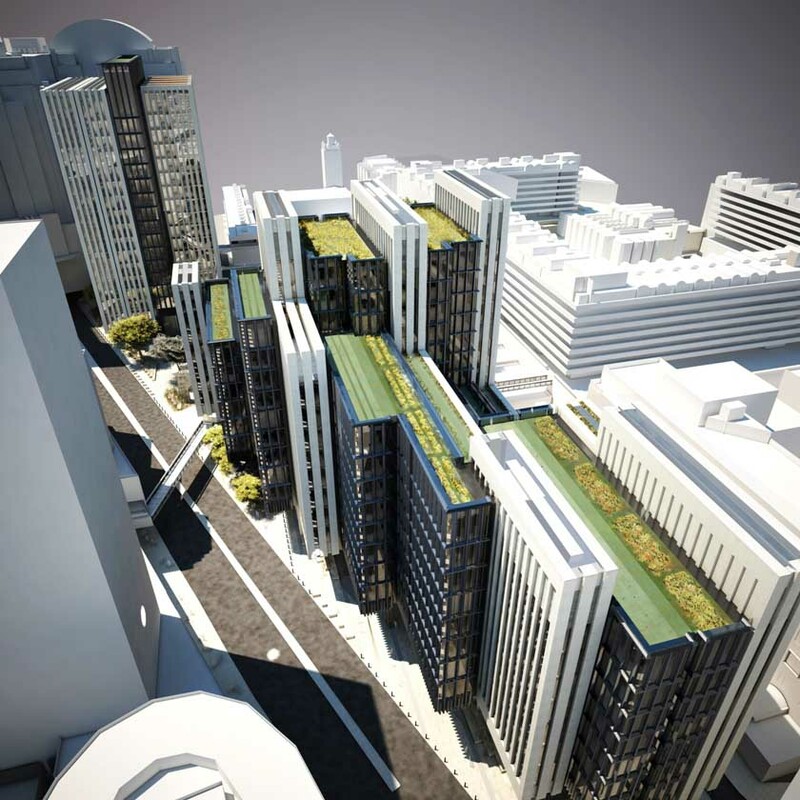 Our design presents modern architecture, with flexible spaces that allow businesses to make their own and also creates a more prominent frontage on City Road and stronger visual connections and links with surrounding listed buildings and pedestrian routes. 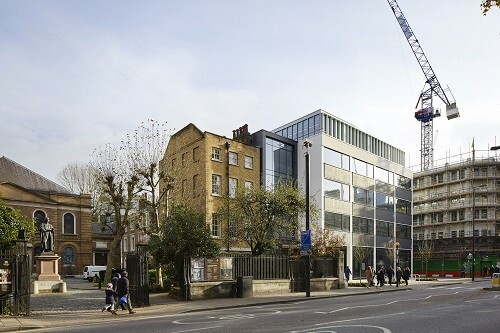 BuckleyGrayYeoman also refreshed the existing facades by adding full height glazing to the ground floor office spaces facing City Road, Epworth Street and Tabernacle Street. The new façade features a white concrete frame and a painted black exposed brickwork with aluminium-frame double-glazed windows.